Research by ILRI and partners shows that in most developing countries, more than 80 per cent of livestock product purchases occur through informal markets — and in places where there is no ‘formal’ alternative, like a western-style supermarket, close at hand. And the studies find that this situation is unlikely to change for decades to come. Also, even where supermarkets are an option, studies in East and Southern Africa have found that, due to a poorly patrolled chain of custody between producer and seller, milk and meat sold in supermarkets may pose a greater health threat than what is sold in traditional markets. Moreover, small producers have many attractions for poor consumers. They are typically within walking distance for people who lack cars and they offer the opportunity to purchase fresh food in small amounts — part of what is known in East Africa as the ‘kadogo’ economy. (Kadogo is street slang for ‘small.’) In addition, many sellers in traditional markets will extend credit and typically offer the traditional foods their customers prefer. Many policymakers mistakenly believe that food-borne illness in developing regions will rapidly decline as the modernization or ‘supermarketization’ of food sales steadily supplants informal markets. But the ILRI studies show that Africa’s supermarket food is not necessarily safer than food in informal markets and also that informal markets are unlikely to disappear — and could even become stronger — in the coming decades. Indeed, the research shows that consumers prefer informal to formal markets, and not just for their lower prices, but also because traditional markets tend to sell fresher food. They also sell local products and breeds, which many consumers continue to prefer — and those preferences seem to intensify as incomes rise. For example, in Africa and Southeast Asia, consumers often prefer local chicken breeds over cheaper imported breeds. A deeper understanding of the entire value web (chain doesn’t apply as the rural ecosystem is as unstructured and informal as the markets) of these informal markets for meat, milk, vegetables and other foodstuffs will offer greater value than towards informing policy alone. Informal retail is expected to grow, and “supermarketization” will neither come fast enough to change this any time soon, nor be able to replace the complex role the bazaar plays in both rural and urban contexts. This is worth remembering for consumer facing brands, especially in the FMCG sector, as well. One of the things that stood out for me during the recent household consumer behaviour study was the lack of weights and measurements used to sell foodstuffs and commodities in the market. There were no weighing scales at all, unless they themselves were for sale. Instead, some form of “socially accepted” measure was used to display various quantities and their price. Shelled green peas can be purchased by quantity displayed, and similar containers can be seen for dried fish and ground coffee as well. When asked, the shopkeeper may refer to each measure by “weight”, saying this is “half a kilo” or that is a quarter but in reality, these are simply approximations. Note how the ground coffee, which is slightly more expensive, is displayed in far small containers, catering to the purchasing power of the consumers frequenting the market. 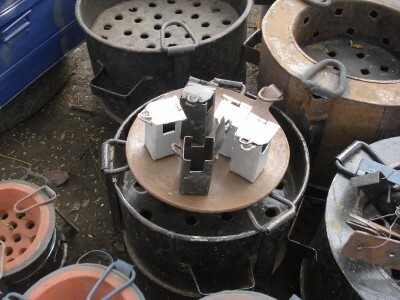 This is called a ‘deben‘ and it is a standard measurement for charcoal across the entire country of Kenya. Prices naturally fluctuate between rural regions and city centers, but the container itself is ubiquitious though the actual amount piled on top might change according to the frugality of the seller. This bagging was a surprise though, as I’d only seen it otherwise in rural Philippines (in informal markets, not supermarkets). This is not common. These so called “social measurements” are intriguing to me. They are rough estimates and approximations and no two piles or containers will ever be alike, yet customers are quite willing for them to be priced the same. There is no pressure to measure exactly or purchase by weight of commodity, something so common in the wet markets of Asia. It seems to me there’s a link between this behaviour and the level of informality of the local market, as well as a greater willingness to accept that something might be “more or less” okay. How does this relate to local perceptions of time and money, the two key uncertainties in these challenging operating environments? These are jua kali manufactured locks for taps, where the padlock goes on the little handles shown and the contraption protects your faucet from either being stolen for scrap metal value or your water being used by unauthorized people. It was seen in the market in Nakuru, Kenya. The concept addresses the need for keeping these faucets secured and locked as unauthorized people may use them. 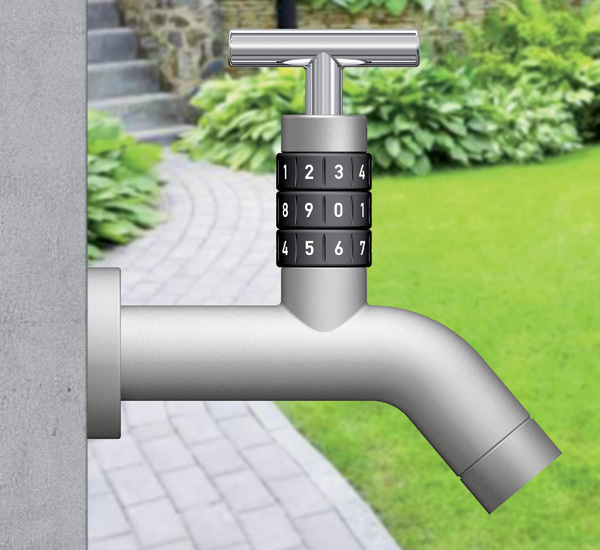 The Locko uses a combination lock system to keep the tap locked and only those who know the combination will be able to use it. This will help prevent water theft (yes this happens!) and wastage. LOCKO is also a 2012 red dot award: design concept winner. Scarcity of resources as a driver for design innovation, indeed. My recent diversion into exploring the increasing visibility of the informal economy in the developed world has been providing much food for thought on the perceived boundary between the formal and the informal. More so, than in Europe, does the need exist among the most economically challenged across the still developing world for ways and means the grassroots entrepreneurs can aspire to their economic ambitions. This though then reminded me of some articles on the topic of boundary spanners – while they look specifically at different types of organizations, it struck me that the same concept could be used a lens by which to assess the ‘borderlands’ between the formal and the informal economy, especially in the developing world where a very significant proportion of the population earns a living from the unorganized sectors of society including subsistence farming. What are some of the existing ‘bridges’ that I’ve seen? As the business model that made mobile phone ownership and usage viable, feasible and desirable for the mass majority in the developing world, this is the best known example of a transaction model that bridges the informal economy and the formal. Even subsistence farmers and daily wage labourers, living on a pittance, can purchase a service from some of the largest and most profitable companies in the world. The flexibility inherent in this model transfers the control over time and money to the enduser, not imposing a payment amount and deadline like a monthly phone bill does. Whether it is television sales in a rural African market or the initerant hawker with sachets of FMCG brands of consumables like coffee or dry cell batteries, when products are sourced from the erstwhile formal manufacturers in China or elsewhere, there is a natural bridge that spans the boundary between the two. 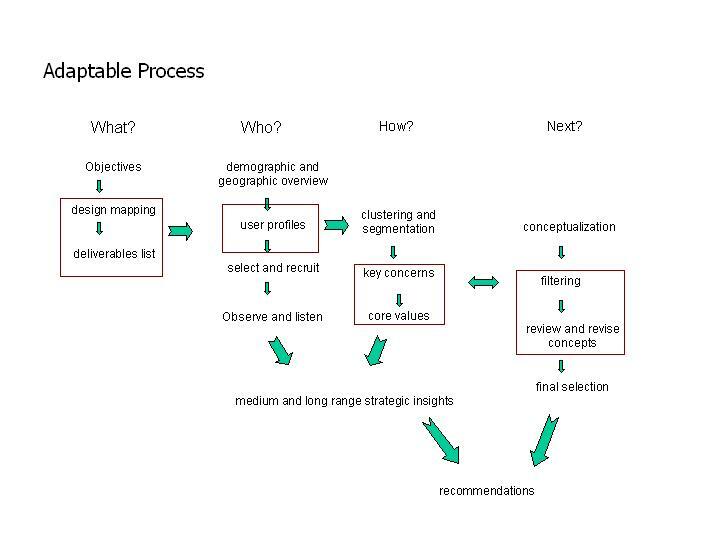 What are the touchpoints where this occurs and how and when it works is an entire area that needs a closer look in order to understand what works and why. From agarbatti makers in rural India to artisans making crafts for sale in Kenya, this is the reverse situation from the above, yet again offering a bridge for cash flow between the formal and the informal. A well known example is the Amul brand of dairy products, which can be traced back to the cowherd in his village. If a cooperative has reached formal status, does it naturally and automatically transfer that to each of the members or will the subsistence farmer or village entrepreneur still be considered an unseen member of the vast unorganized sector? Essentially, it seems as though that at point point in the distribution network or supply chain, the locus of activity shifts emphasis from one to the other. And at some point the red tape that separates the two begins to act as a barrier. At least in much of the developing world, such as in India where close to 90% of those employed are classified to be working in the unorganized sector, this red tape comes with additional social and economic hurdles which seem too challenging to be crossed. How then can the concept of boundary spanners help in this case? By framing them as those who go back and forth between the rigid and the flexible or as a semi-permeable membrane that can offer benefits to either side? This line of thinking will continue to be pursued. Gallup conducted the survey on behalf of the World Bank and their comprehensive synopsis available online (with links to the full report) offers a few more charts in addition to the map above. These look at bank account ownership among adults in different regions comparing rural to urban, genders as well as the reasons stated for not having one. What I’d be interested in would be to map those resulting patterns against a comparative map of the percentage of the regional economy that was identified as “informal” – I wouldn’t be surprised to see a link there as well. This is a map from 2001 using ILO data on the informal sector while given below is a more recent one which maps the percentage of the economy dependent on the informal sector. Although half of adults worldwide do not have bank accounts, at least 35% of them report barriers to account use that public policy could address. Among the most commonly reported barriers to having bank accounts are high cost, physical distance, and lack of proper documentation, though there are significant differences across regions and individual characteristics. These barriers suggest that a key to reducing the gap in financial inclusion is the expansion of new processes, products, and technology, such as mobile banking, that can provide affordable and accessible banking services, particularly to the rural poor. Shankar Jadhar’s friends describe him as an “all-rounder”. The 40 year old Dharavi resident is married with 5 children and lives close to the traffic island which he has laid unofficial claim to, from where he conducts his business. He had been a barber for 20 years but when the road was altered 5 years back he lost his barber’s stall. Now he’s set up a makeshift stall and a shack to store items for his work in Dharavi’s recycling chain, encompassing multiple sources of income from the single location. He buys various items (shoe soles, plastic bottles, glass bottles, wiring for its coper content) from local ragpickers which he then sorts and cleans up to sell on to middle men who deliver specific goods to recycling units elsewhere in Dharavi. There are bigger operations that do the same job utilising salaried workers but Shankar enjoys the independence of being self employed and amongst his community as he works. He makes better money from his recycling enterprise than his barber stall so he’ll make haircut & shaving customers wait till evening if he has a big haul of recyclables to get through. On average he profits Rs 150-200 per day. Sometimes he employs up to 2 others to assist when he has a lot to get through (paying Rs 30-50 per day). On further questioning of his friends it seems that often others help him for short periods at no cost as his spot is a kind of neighbourhood hangout centre – though I’ve noted on numerous visits that Shankar is always busy on something and doesn’t sit around himself. Although he has erected a semi-permanent structure on the traffic island, the authorities have turned a blind eye due to the bribes he pays 2-3 times a year (Rs 100-200). Being well regarded in the area, Shankar has never been a victim of theft. During monsoon his earnings are reduced by around 25-35%. He also fails to earn if he is sick or during the 3-4 weddings he attends a year plus income drops during the monsoon season. I’ve started to discuss savings and loans with him and will be getting more into this during upcoming interviews. His income is supplemented by his wife’s Rs 2000 per month salary which she earns washing dishes, etc for a middle class family in Bandra for 4 hours daily.